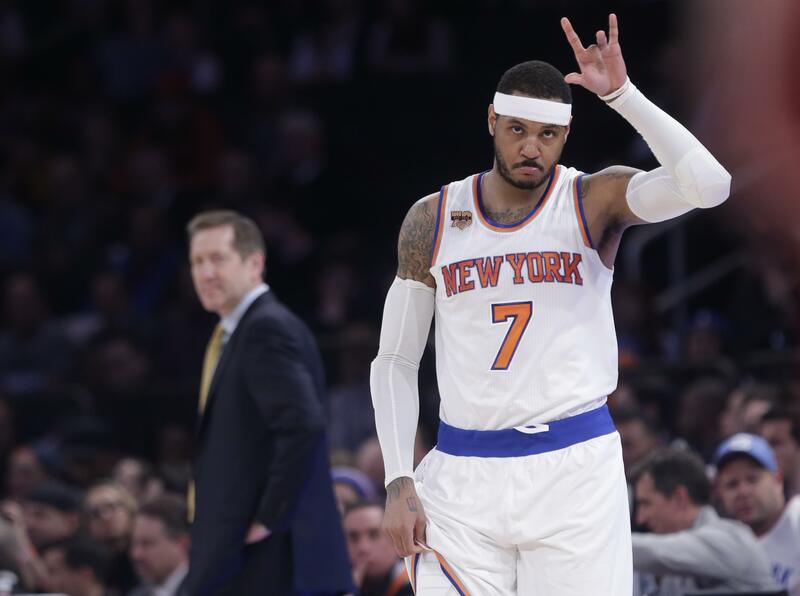 Sat., Sept. 23, 2017, 11:11 a.m.
NEW YORK – The New York Knicks agreed to trade Carmelo Anthony to the Oklahoma City Thunder on Saturday for Enes Kanter, Doug McDermott and a draft pick, a person with knowledge of the deal said. The person spoke with the Associated Press on condition of anonymity because the trade had not been announced. A day after saying they expected their All-Star forward to be at training camp Monday, the Knicks finally found a trade they were seeking since last season. It puts Anthony into a loaded Oklahoma City lineup that includes NBA MVP Russell Westbrook and Paul George, who was acquired from Indiana this summer. Anthony will see his old teammates soon: The Knicks open the regular season at Oklahoma City on Oct. 19. Anthony agreed to waive his no-trade clause to complete the deal, which was first reported by The Vertical. It saves the Knicks and their longtime star from what could have been an awkward reunion next week. Phil Jackson spent the latter part of his time in New York making it clear he wanted to move Anthony. But a deal was difficult because the 33-year-old forward has two years and about $54 million left on his contract, along with the ability to decline any trade. He had long maintained that he wanted to stay in New York, but the constant losing and a chance to play with a talented lineup convinced him it was finally time to go. After making the postseason each of his first 10 seasons, he has been on the sidelines the last four years and said at the end of last season his priority was a chance to win. He wouldn’t have that in New York, where the Knicks are emphasizing youth and have little proven talent with which to surround Anthony. But he is close with Westbrook and George and should fit in nicely. He can possibly settle into the spot-up shooter role he’s played in the Olympics, where he’s won a record three gold medals and is the career scoring leader for the U.S. men. Published: Sept. 23, 2017, 11:11 a.m.